A dear friend of mine, Wavinggirlsav Voom, told Charlie vanAlten and me in Second Life that her mother had been looking for her brother, her Uncle Johnny, for nearly 60 years. All she knew was that a soldier came by when she was a teen, and told her grandparents that her mom's brother had died somewhere in Europe in WW-II as he got out of a tank. Her Second Life friends, including Charlie vanAlten and me, well, we didn't have much to go on. Just the name John Dikun, Europe, and WW-II. There already had been many feelers put out by his niece. She had already made many postings to BBS's and military groups searching for John. But all of our searching through military records came up nothing, and deep Google searches only found the many posts from her searching. Charlie was a member of the British Army, and he put out feelers to his contacts, and so more people searched through the records. But there was nothing to go on. And so the trail stayed cold. Then something happened in Second Life. ... and a very old and very faded photo of a graveyard cross! 'John Daken S/N 32201216.' ... We had found John Dikun. After that it was easy to locate John' battles, his story, and his grave. We found that he had fought in many battles in WW-II. He died stopping the German Army in a key battle that led to the entrapment and destruction of an entire German Army. We found the unit history of the 32 Armor Group and posted it here. Then we sent it to her. And the next day, John's niece sat down that evening with John's sister, and told her about her brother. And yes, they both cried. Why was he lost for 60 years? Later, we found out what had happened. John changed his name when he entered the Army. This was quite common for people of Czech descent, and another of his brothers had changed his name to Daken. No one knew realized that John did, too. 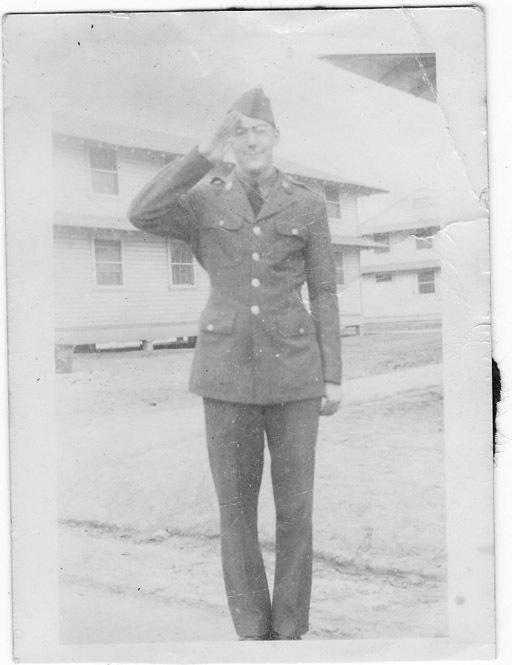 We also found that since John's sister was just a teen when he was KIA in 1944, her grandparent had received this photo in 1945 from the Army, they never showed it to her. When they passed away, it went to one of his sisters, and when she passed away, it was sent to and found by his last sister and her daughter, John's niece, Waving Girl, after nearly 60 years. The only clue had been there for almost 60 years, slowly fading away, and forgotten. But John was never forgotten. 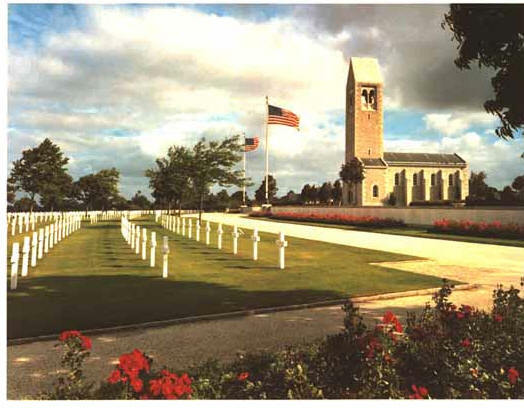 John now lies Plot J, Row 7, Grave 13 in the Brittany American Cemetery in St. James, France, along with 4,409 others, in an area liberated by John's unit just 5 days before he was killed in action, and just a few miles down the road from Mortain, where John died in the opening of one of the great battles of WW-II, helping to stop an advance that would have cut our Army in half. 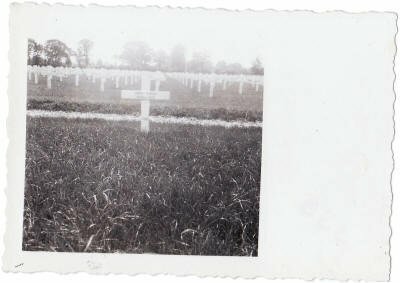 I emailed the cemetery yesterday (late Friday night), told him what we had found, and promptly received two photos of John's grave, as it is today (Saturday morning), from Mr. Jeffrey Aarnio, the Superintendent at the Brittany American Cemetery, far faster than the web sites promise of a 5 day reply and the very different time zones. Put simply, it was unbelievable. They must have gone out in the first light on Saturday. I forwarded them to his niece and sister, and she replied asking about the gold lettering that I had not noticed. When I replied to thank him and his staff for the very quick reply and the photos, I mentioned that his niece and sister had been surprised by the American flag, the gold lettering that is so obviously not faded, and that is only on his grave. "The gold you see in the photos is actually sand from Omaha Beach that we moisten with water so that it stays in the engraving and we brush off the excess with a cloth. The following rain will wash it out without staining the marble headstone and contrasts very nicely with the whiteness of the stone. I'm glad we can do our small part to honor their memories.". To that I could only reply, "Very well done, sir!" 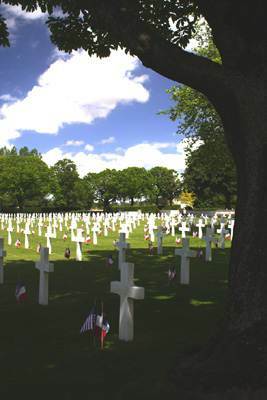 "Time will not dim the glory of their deeds" - General of the Armies John J. Pershing. It is because of John Dikun, and others who fought with him, that we are free today. 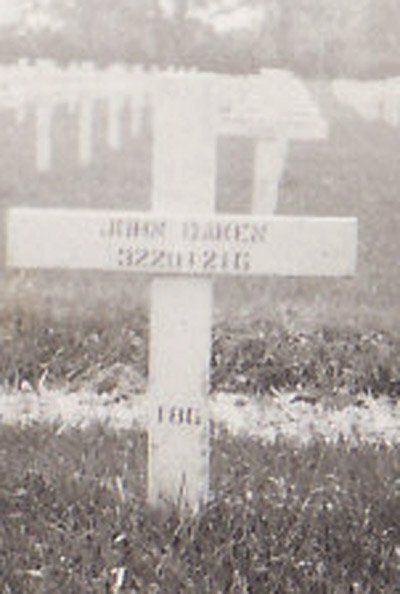 John died stopping the German Army in a key battle that led to the entrapment and destruction of an entire German Army. You should fly a flag on Memorial Day for all veterans of wars. And don't ever let our veterans fade away.